We have built up a solid group of companies, with a strong distribution network and strategic partners. The company has its legal and production headquarters in Canale d’Alba, Italy; a second production site in Jordan; two subsidiaries, one in Spain and one in Brazil; a regional sales office in Jordan and one holding company in Poland. The markets of Latin America and Far East are followed by regional sales managers respectively in Argentina and China. 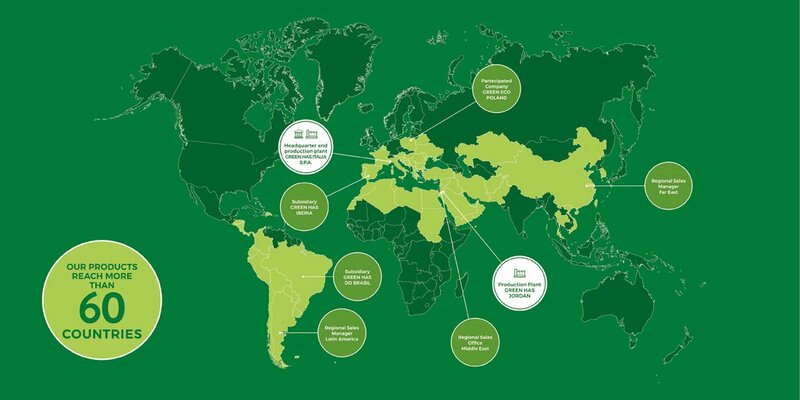 GREEN HAS ITALIA products reach over 60 countries worldwide, each and every day, satisfying the needs of farmers and lending particular care in cases of diverse nutritional cultivation.